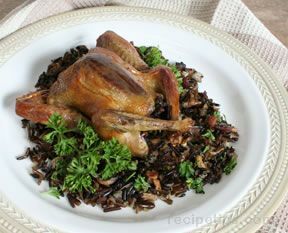 Squab combined with wild rice creates a dish of complementing flavors that are wild and earthy. In a small skillet, cook bacon until crisp and crumbled. Remove from pan. Reserve drippings to sautÃ© green onions and mushrooms until tender. Add sautÃ©ed vegetables and crumbled bacon to 3/4 cup of cooked wild rice and chopped parsley. Lightly stuff squab with wild rice mixture. Truss legs with dental floss or cooking string. Bake leftover wild rice mixture alongside the squab. Brush squab with olive oil before baking. Bake about 45 minutes or until tender. Baste squab with wine 2 to 3 times while baking. Serve on a bed of rice.